Cloud-based CRM is changing the way we work and communicate at a faster pace than most of us had imagined. There will come a time when working from your office desk will become less feasible. Also, the client interaction will be faster and efficient through online platforms. The benefits are higher for Education consulting firms and some also have cloud-based platform for your clients. For example, your clients and partner institutions are more pleased if your agency provides them instant responses and updates. For that to happen, you and your employees must have instant access to all your office work and resources through Agency Management Software, cloud-based education platform. The client service process is delayed if your staff starts looking for folders and searching for files. Examining the endless list of documents every time your clients request some information will consume more time. Just imagine, with clients seated in your office, you can’t find the right folder even after spending more than 15 minutes looking for it. For this, what you can do is get best CRM for consulting firms. Thankfully, we have a cloud-based CRM such as Agentcis that frees education consulting firms from the hassles of working from work desk. Also, decreases your work of going through numerous folders. You can focus on business while these platforms take care of all your data. Most trusted online applications are capable of storing all the data and information in highly secured remote servers. The benefit of using a cloud-based platform is that you can access your work just like your email. You can access it from anywhere, anytime if you have Internet connectivity. CRM for consulting firms have uncountable benefits for your education consulting firms. You can also check out the benefits on small biz trends. Quite interestingly, this ease of access automatically opens door to several other possibilities. Agentcis, the cloud-based agency management system smartly integrates various modules together to make a better platform for the Education and Migration Agents, such as User Management, Client Relationship Management, Partner & their Product Management, Task Management, customizable Service Workflows, unique Invoicing System and last but not the least, Reporting module. Using Agentcis, authorized users can access work on any device simultaneously in real-time, no matter where they are. This makes collaboration among your departments, branches, and partner institution(CRICOS registered universities) in your consultancy much easier and better. In urgent situation, the staff of your education consulting firms who cannot reach the office, can execute high priority tasks from home or anywhere by simply accessing Agentcis online. Online platforms like Agentcis are most useful for agency operators and senior staff who usually travel to attend programs. They can track all activities online from progress on a client’s application. Including the status of pending invoices to instant reports on the key aspects of the business. Therefore, they can make informed decisions quickly from anywhere. What makes an online platform a smart choice is a cost it can save your education consulting firms. We hope we are able to convince you why Agentcis is best for your Education consulting firms. Agentcis provides more flexibility to you and your staff without compromising your responsiveness, timeliness, and service quality. 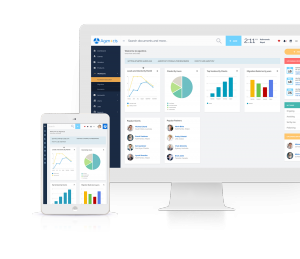 This agency management software helps you to achieve your goals.